Arriving Barcelona airport. Arrival time TBC. Transfer to hotel for check-in. (*no activity for arrival after 15:00). Dinner is not guaranteed for arrival after 20:00. 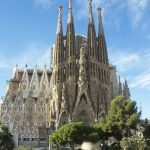 Barcelona orientation tour – the Columbus Monument and La Rambla, followed by Sagrada Família. Estadi Olímpic Lluís Companys, the main stadium for the 1992 Summer Olympics for panoramic view of Barcelona from the hill. Then time for shopping opportunity at Plaza Catalonia. Check out hotel. Continue Barcelona orientation. Transfer to Barcelona Saints railway station for the train to Madrid. Arrive Madrid Puerta De Atocha station. The rest of the afternoon at leisure. 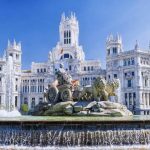 Madrid orientation tour – drive through the Cibeles Fountain. Visit Plaza Mayor, Piazza di Spagna, Plaza de Colón and Royal Palace of Madrid. Then continue to the Puerta del Sol, a public square in Madrid. Another shopping opportunity for leather goods, clothing and traditional Spanish souvenirs. 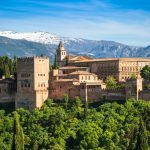 Check out hotel and drive to Granada, the last stronghold for the Arab Dynasty during its eight-hundred-year-long rule in the Iberian Peninsula. 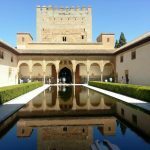 Visit the Alhambra, also known as the Red Palace. Check out hotel and drive to Cordoba. Visit the Cathedral Mosque of Córdoba, the former mosque of the caliphs, a jewel of Hispano – Islamic art featuring striking arches and Byzantine mosaics. Drive to Seville for overnight. Check out hotel. 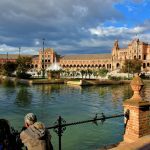 Orientation tour Seville – the capital of the Muslim dynasty hundreds of years ago and the birthplace of the flamenco dance. Visit Seville Cathedral, the largest Gothic cathedral and the third-largest church in the world. Also has the tomb of Christopher Columbus who discovered the New World. 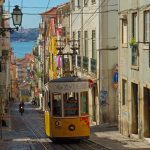 Drive across the border into Portugal and to the city of Lisbon. Expected to arrive in the late afternoon or early evening and the rest of the day is at your leisure. 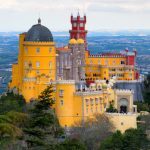 Lisbon orientation tour – the city centre and visit Belém Tower, Jerónimos Monastery, both were classified a UNESCO World Heritage Site. 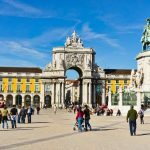 Drive through Marquis of Pombal Square and then stop at Rossio Square for some free time. Check out hotel. Transfer to Lisbon airport for international flight departure.